Due Monday, April 1, 2013. This will be checked and graded. MOSES GEORGE HOGAN, born in New Orleans, Louisiana on March 13, 1957, is a pianist, conductor and arranger of international renown. A graduate of the New Orleans Center for Creative Arts (NOCCA) and Oberlin Conservatory of Music in Ohio, he also studied at New York’s Juilliard School of Music and Louisiana State University in Baton Rouge. Mr. Hogan’s many accomplishments as a concert pianist included winning first place in the prestigious 28th annual Kosciuszko Foundation Chopin Competition in New York. Hogan was recently appointed Artist In Residence at Loyola University in New Orleans. Hogan began his exploration of the choral music idiom in 1980. Hogan’s former New Orleans based Moses Hogan Chorale received international acclaim. His discography includes a recording of arrangements of spirituals for the acclaimed soprano Barbara Hendricks, sung by the Moses Hogan Singers entitled Give Me Jesus, produced by EMI Virgin Records; An American Heritage of Spirituals, sung by the famed Mormon Tabernacle Choir, conducted by Moses Hogan and Albert McNeil; Two recordings of spirituals with renowned countertenor Derek Lee Ragin on Aria Records and on Channel Classic Records; This Little Light of Mine, featuring Hogan’s most recent commissions and dedications, with excerpts from the Oxford Book of Spirituals, MGH Records: The Moses Hogan Choral Series 2002, features a collection of thirty-nine spirituals and songs of faith, sung by the Moses Hogan Chorale and Moses Hogan Singers, with excerpts from the Oxford Book of Spirituals, produced and arranged by Moses Hogan, MGH Records; Lift Every Voice For Freedom, a collection of American folk songs, poems, hymns, songs of faith and patriotic songs. Hogan served as editor of the new Oxford Book of Spirituals, an expansive collection of spirituals, published by Oxford University Press. Hogan’s contemporary settings of spirituals, original compositions and other works have been revered by audiences and praised by critics including Gramophone magazine. With over 70 published works, Hogan’s arrangements have become staples in the repertoires of high school, college, church, community and professional choirs worldwide. Hogan’s choral style, high musical standards and unique repertoire have consistently elicited praise from critics worldwide. Hogan was an exclusive arranger and composer for Hal Leonard Music Corporation and a member of Phi Mu Alpha Fraternity and ASCAP. Hogan’s choral series is published by Hal Leonard Corporation and by Alliance Music Publishers. Moses Hogan died unexpectedly on February 11, 2003 at the age of 46. Moses Hogan, Artistic Director, began exploring the choral music idiom in 1980 with the organization of the New World Ensemble. In 1994, Hogan’s acclaimed Moses Hogan Chorale, which completed its final touring season in 1999, came to the notice of the American Choral Directors Association, which extended invitations to perform at its conventions on both the regional and national levels, and these appearances in turn led to invitations from around the world. The Moses Hogan Singers continues this performance legacy while preserving and celebrating the heritage of the African-American choral tradition. A nationally auditioned ensemble, the MOSES HOGAN SINGERS made their debut in 1998 in New York at Alice Tully Hall during the World Projects Corporation New York Choral Festival. The Moses Hogan Singers made their recording debut in 1998 on the EMI record label with acclaimed soprano Barbara Hendricks on the release entitled Give Me Jesus, which features the arrangements of Moses Hogan. The Singers recently completed two international tours with Ms. Hendricks to Greece, Germany, Spain and Switzerland during the summer of 2000 and to the Netherlands and Belgium in December of 2001. The Moses Hogan Singers made their European Orchestral debut with the I Flamminghi Orchestra, Rudolf Werthern, conductor, for the televised Christmas Special with Barbara Hendricks at Sint Jan Cathedral, s’Hertogenbosch, the Netherlands. The Moses Hogan Singers are a collaboration of musicians dedicated to the preservation, integrity and excellence of the multiple aspects of choral music. Special repertoire emphasis is focused on the choral works of Mr. Hogan and works by African-American composers. Concert performances in the United States during the 2002-2003 season will include recitals in Michigan, Georgia, Louisiana, New York and California. YouTube video (http://youtu.be/mZR6_ysIeMc) of the Moses Hogan Singers performing Moses Hogan's 1996 arrangement of "The Battle of Jericho." The Battle of Jericho is an incident in the biblical Book of Joshua, (Joshua 6:1-27) the first battle of the Israelites during their conquest of Canaan. 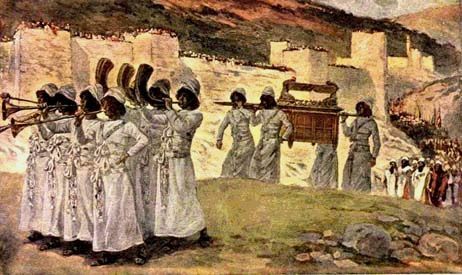 According to the narrative, the walls of Jericho fell after Joshua's Israelite army marched around the city blowing their trumpets. Their horns/trumpets were shofars. A shofar is a horn, traditionally that of a ram, used for Jewish religious purposes. Shofar-blowing is incorporated in synagogue services on Rosh Hashanah and Yom Kippur. Spying on Jericho Before crossing into the land west of the River Jordan, Joshua sent two spies to look over the land. 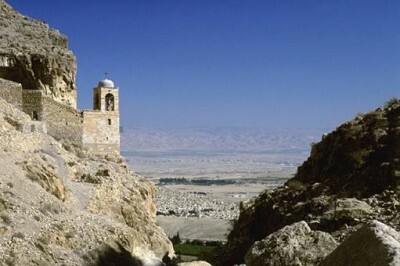 The king of Jericho heard that two Israelite spies were within his city and ordered them to be brought out to him. The spies were charged with ascertaining where the guards were placed, whether anyone disliked the king and could help them, what weaponry and armour the guards had, when the guards changed shifts, how much food, water, and other supplies the city had, and the height and width of the walls so as to determine how to overcome the city. She must not later turn in the spies. Rahab agrees to the conditions: she hangs a scarlet rope outside her window to distinguish her house from the others. Safely escaping the city, the two returned to Joshua and reported that the "whole land was melting with fear." 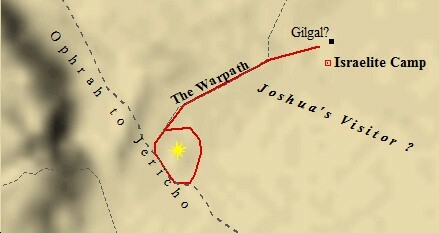 The biblical account describes the Israelites being led by Joshua and crossing the Jordan into Canaan where they laid siege to the city of Jericho. There, God spoke to Joshua telling him to march around the city once every day for six days with the seven priests carrying ram's horns in front of the ark. On the seventh day they were to march around the city seven times and the priests were to blow their ram's horns. And Joshua ordered the people to shout. 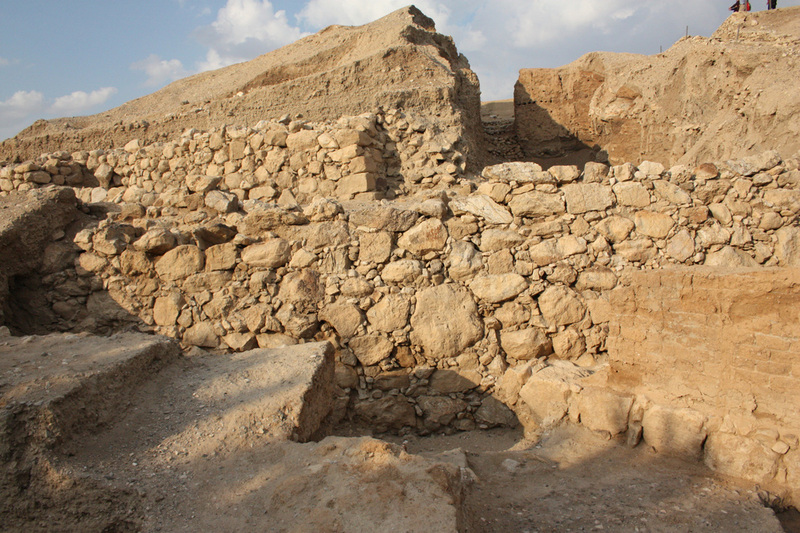 The walls of the city collapsed, and the Israelites were able to charge straight into the city. The city was completely destroyed, and every man, woman, and child in it was killed. Only Rahab and her family were spared, because she had hidden the two spies sent by Joshua. After this, Joshua burned the remains of the city and cursed any man who would rebuild the city of Jericho would do so at the cost of his firstborn son. 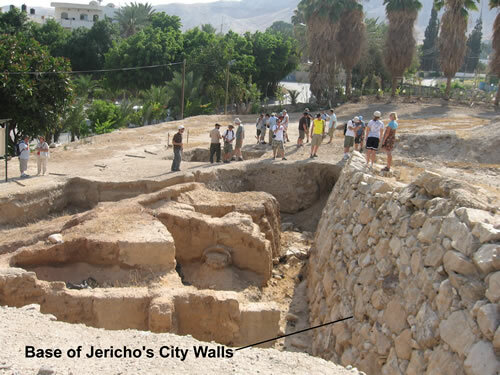 Another picture of the ancient ruins of Jericho. 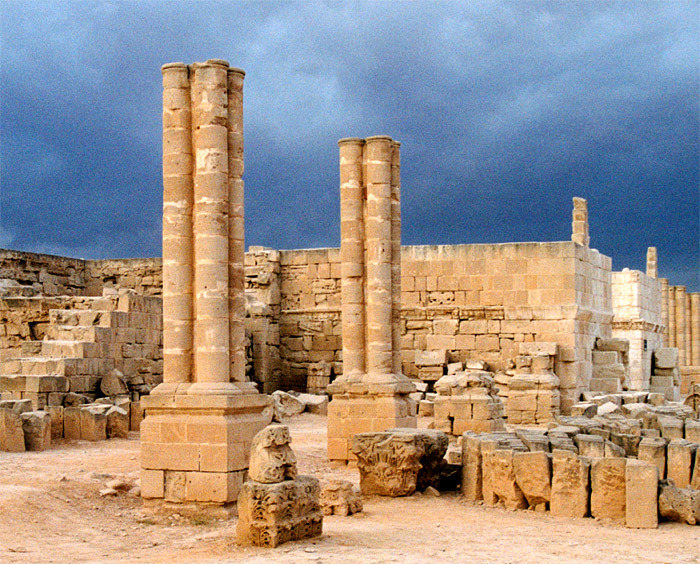 The ruins of ancient Jericho in modern day. YouTube video (http://youtu.be/QnyqFCA7gtI) of a shofar being blown. a children's video of the story of joshua, from the christian perspective. for children to understand and enjoy. Not all aspects of the story are told. von Carolsfeld's wood carving is done in the late Renaissance style, even though he lived over 200 years after the Renaissance. Notice the detail created in the wood carving. Observe how the garmets of the Israelites flow freely in the craving along with the flag. Also notice the use of light as well. Just like many of the other pieces of art work displayed, the Ark of the Convenant are behind the seven priests blowing the trumpets. 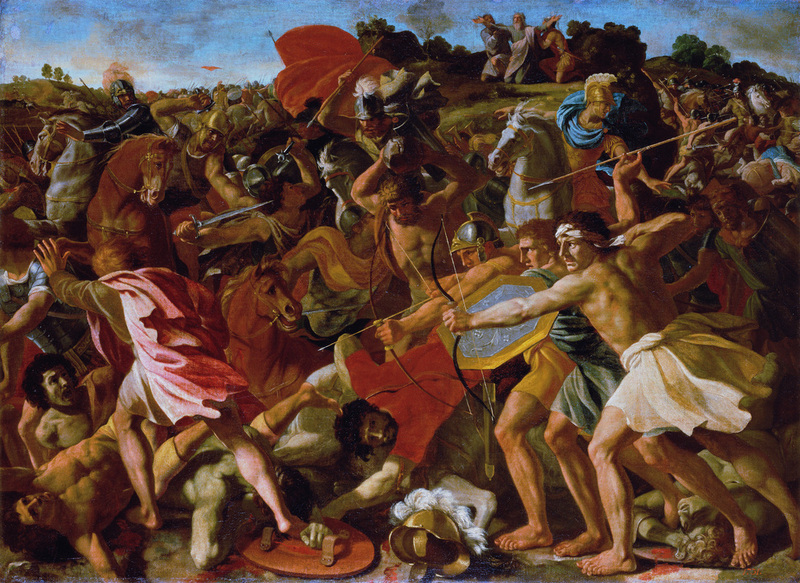 This painting brings to life the chaos that ensued during the bloody battle after the walls came down in Jericho. Notice how the artist painted the subjects closely together; and notice the use of vibrant colors to emphasize the idea of chaos. In the spring of 1967, when the steel was being cut for the four triangles that make up the pyramidal half of my Broken Obelisk, I became intrigued – intrigued is a better word than inspired – with the triangle as a possible format for painting. It was at that moment that I ‘saw’ paintings on the huge sheets of steel. Later that year I had some stretchers made for two triangles and the challenge of the triangular format began for me. I must explain that the triangle had no interest for me either as a shape in itself or because it has become stylish to use shaped canvas. After all, I had done the so-called ‘shaped canvases’ or what is more correct in my case, ‘no-shape’ canvases, as far back as 1950. What I wanted to do was find out whether or not the triangle could function for me pragmatically as an object and whether it could also act as a vehicle for a subject. Could I do a painting on the triangle that would overcome the format and at the same time assert it? Could it become a work of art and not a thing? I knew that if I conformed to the triangle I would end up with either a graphic design or an ornamental image. I had to transform the shape into a new kind of totality. In a sense this was no different a problem than the rectangle except that the triangle brings back into painting physical perspective with its three vanishing points. How to do a painting without getting trapped by its shape or by the perspective was the challenge here. It was only when I realized that the triangle is just a truncated rectangle that I was able to get away from its vanishing points. I knew that I must assert its shape, but in doing so I must make the shape invisible or shape-less. I realized that after all it is nothing more than a slice of space, a 'space vehicle', which the painter gets into and then has to get out of. It was this drama, my involvement in the existence of the triangle as an object and my need to destroy it as an object, that made it possible for me to begin painting them. After all, format as format can be a trap. I called one painting Chartres because of the strong assertion of my inner structure in contrast with the outside format and because of the even light in the painting which has for me the evenness of Northern light – a light without shadows. The title Jericho explains itself. Fouquet's painting depicts the Battle of Jericho in the context of the Renaissance. 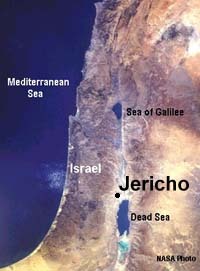 Notice how the "place" of Jericho is done in the manner of the European countryside, rather than the true setting of the barren desert. Also notice that the architecture is done in the Tudor style as well. Was this done so the Renaissance viewer could relate to the painting in his own context? 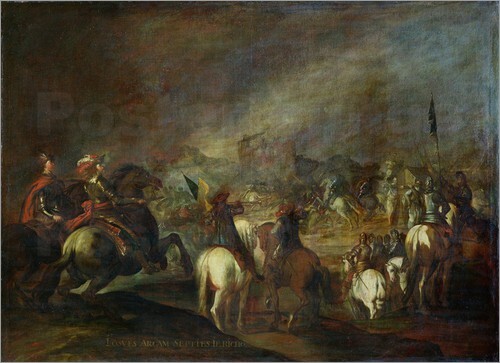 This painting depicts the Israelities on horse back charging into Jericho for battle. Unlike the other Baroque painting, this artist chose to use more subdude and darker colors. Notice how the images in the background are muted and less visible, as if the dust from the walls is still clearing. These two paintings, done by the same artist, depict the battle of Jericho. The seven priests are shown with the trumpets in front of the Ark of the Covenant. The Israelites follow as they march around the city of Jericho. 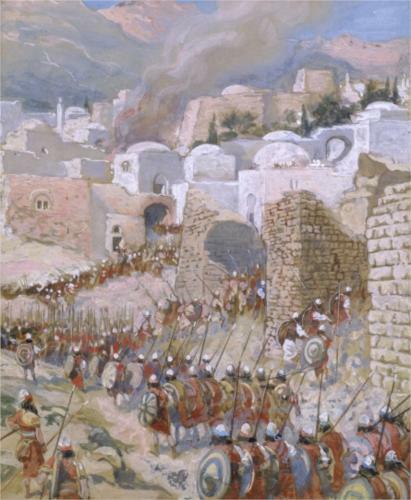 In the second painting the Israelites charge through the walls into battle. Notice how the artist, Tissot, uses light and color in both of these paintings to create a mood and evoke emotion.